Looking for a hotel chain with no pet fee? Or one that will accept your very large dog? Or both? Sometimes it’s not so easy. That’s because pet policies vary widely among the tens of thousands of pet-friendly hotels in the U.S. These policies differ regarding the type of pet you can bring, the number of pets, the size of the pet, and the amount of pet fee and/or deposit you will have to pay. There are very few constants and, when researching a pet-friendly hotel, you definitely need to do your homework to make sure that your pet and your wallet are in sync with the hotel’s policy. Fortunately, there are a number of great pet-friendly hotel chains that make it easy for you. These are chains that have one policy for all their properties so that if you’re on the road and see, for example, a La Quinta, you will know that your large dog (or dogs) and/or cat will be welcomed and that you won’t be charged a pet fee. However, this consistency is rare. Most large chains leave it up to the individual property to decide the pet policy so that a Best Western in one city might charge a fee and limit the size of your pet while another one will have no pet fee and no weight limit. Unfortunately, differing policies within the same chain is the rule rather than the exception. At petswelcome, we try to make it easy for you to find the policy that works for you and your pet. First, you can do an Advanced Search and search by type of pet, your pet’s weight and the maximum pet fee you are willing to pay, even the hotel chain you prefer to stay at. You can also save those parameters in a Petswelcome Passport account so that every time you come back to find a pet-friendly lodging, your information will automatically be taken into consideration in your search and you’ll immediately find hotels that match your specific needs. No more wading through tons of hotels that are not suited to your requirements. The following are great pet-friendly hotel chains with no pet fee. All have consistent pet policies and, beyond not charging for your pet, many also do not have weight limits. Is La Quinta pet friendly? You bet. They accept dogs of any size and cats in all guest rooms, allow up to two pets per room, and do not charge a pet fee or deposit. And with over 800 pet-friendly properties, you can feel confident that you’ll find one at your next destination. With newly renovated hotels, and a best rates guarantee, you and your pet will sleep well knowing you’ve found the hotel chain that’s just right for you. Motel 6 is well known as a great choice for a lodging if you’re traveling on a budget. It’s also a great choice if you’re traveling with a pet. They allow up to two pets per room and do not charge a pet fee. Motel 6 bills itself as America’s original pet-friendly hotel chain and, with such a long and admirable history of welcoming pets through their doors, you can be sure that you and your favorite animals will be treated as the special guests you are. How do we know Red Roof Inns are pet-friendly? Not only do they allow one well-behaved pet per room, have no weight limit, and don’t charge a pet fee, they also offer a 10% discount to people who travel with their pets. Now that’s not only pet friendly, it’s human friendly, too. 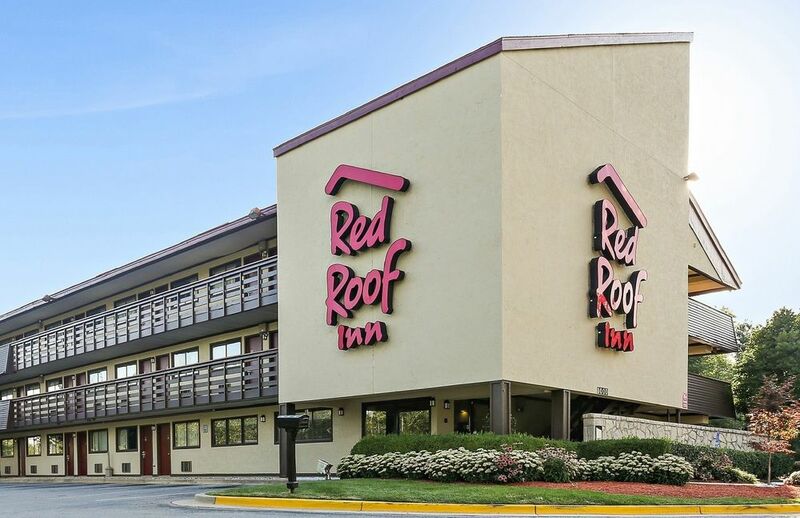 With over 360 locations throughout the U.S., Red Roof Inns are likely to be found wherever you take your pet. Canary Hotel. 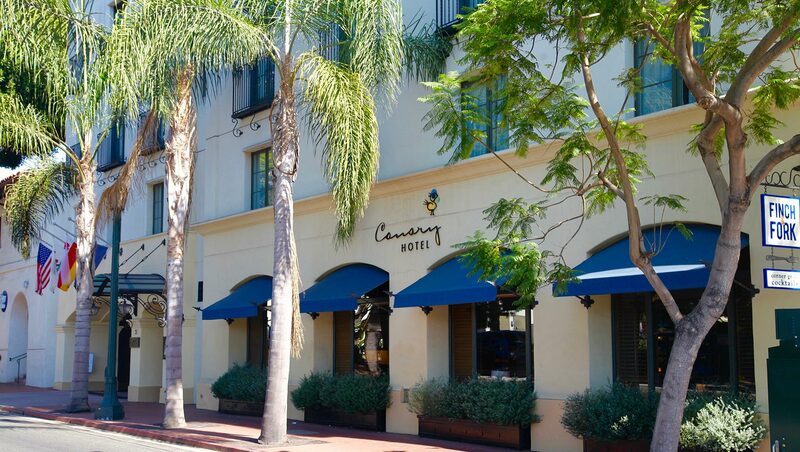 A Kimpton Hotel in Santa Barbara, CA. Kimpton is an upscale boutique hotel chain with 60+ properties that absolutely loves pets. No matter the type of pet, no matter their size or weight or breed or number, if your pets fit through their door, Kimpton will welcome them with open arms and at no extra charge. Many Kimptons offer pet beds, food and water bowls, as well a concierge list of pet-friendly restaurants, parks and boutiques nearby. Located in major cities throughout the U.S., Kimpton should definitely be on your list to visit if you’re looking for luxury, fun and quality time with your favorite animal. As always, we highly recommend you do your homework ahead of time when hitting the road with your pets so you can find the pet-friendly hotel options that work best for you. However, there might come a time, late at night, when you’re driving down the road, tired and looking for place to stay without any notion of what you might eventually find. It’s good to know that if you see one of these chains on the horizon, you can be assured that you and your pet will find comfort and rest within their welcoming glow.